Financial planning assistance is essential at all phases of your life, whether you are making a fortune or just getting by. If you don’t make smart money choices and make your money work for you, you could end up facing financial struggles throughout your life. Money worries are a prime source of stress and can cause everything from health problems to relationship breakdowns. You shouldn’t need to worry about whether you’re making smart money moves – you should get the help you need. Who needs help with financial planning? What kind of financial planning assistance is available? How can a Long Island financial planning lawyer help me? Many people have misconceptions regarding who should actually talk with a financial planner. If you have a lot of money and feel like you’ve got things under control, you may not feel as if financial planning advice is something you need. On the other hand, if you are living paycheck to paycheck or struggling to get by, you may think financial planning help is something that only rich people have to worry about. The reality is, everyone can benefit from a professional perspective on how to make the most of your money and how to protect your wealth. Whether you are worried you aren’t saving enough or you have a substantial nest egg that could potentially be vulnerable if you are sued or face high nursing home bills, you should get advice to make smart choices. An attorney with financial planning experience can assist you in taking advantage of tools that New York and federal law provide to help your money grow and stay safe. Maximizing tax advantages associated with certain types of saving, such as college and retirement savings. We will assist you in exploring the use of IRA accounts and college savings accounts that give you a boost from the government to help make saving easier. Protecting assets in case of incapacity, costly nursing home expenditures, lawsuits, and other primary sources of loss. There are steps you can take, ranging from trust creation to incorporation, to keep your nest egg secure. Setting savings goals for long-term and short-term needs. We can assist you in determining what to save and how to save it. Understanding investment options. We can provide you with guidance on making informed choices when you invest. Retirement planning. We help you to get ready for retirement and to try to make your money last during your retirement years. Legacy planning. When you’ve built up a nest egg, you want to protect it and ensure you can use your wealth to provide for family and charity after you are gone. Avoiding estate taxes and otherwise taking steps to secure your legacy becomes important as you build up wealth. When you work with a financial planning lawyer, we can carefully review your life situation including your sources of income, your current investments, and your family situation. We provide you with assistance in determining what tools you should be using to build upon your current financial successes and to make the smartest money moves in the future. From IRAs to trusts to incorporation to creating a power of attorney to writing a will, there are a huge variety of legal tools we help you use. 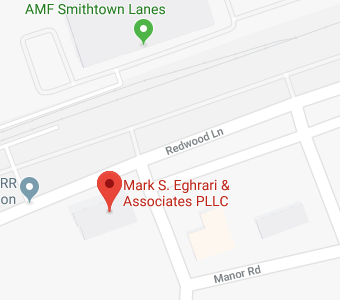 Eghrari Law Firm is passionate about providing financial planning help to people in Long Island and to clients throughout Suffolk County. We believe that everyone deserves to have something to show for their lifetime of hard work and we want to make sure you can use your money to build a more secure future. We are committed to providing you with the legal advice and advocacy that you need to achieve financial security for yourself and for the people you love. Give us a call at (631) 265-0599 or contact us online to find out more.